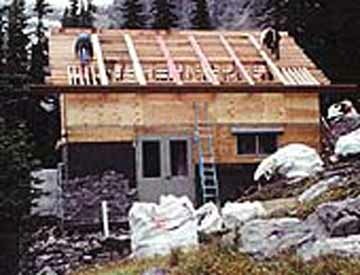 Sometime in the summer of 1988, in the wondrous high country of Montana's Glacier National Park, construction workers will put the finishing touches on a new federal building. Designed by six architects and engineers employed by the National Park Service, the two-story structure is truly unique: a $1 million, four-hole outhouse that will serve only a few thousand of the two million visitors who flock to Glacier each year. The toilets are state-of-the-art, solar-powered composting units with a backup propane generator designed to work in extremely cold weather. The upper level of the stone-clad building includes the restroom stalls, a workroom, a porch and an attic. The lower level has a storage area and two rooms for the composting equipment. To Ed Venetz, the private contractor who is supervising the job, the rustic, 28-by-19-foot outhouse is a thing of beauty. "She's just a Plain Jane, like sitting in a prison toilet," Venetz says of his creation, "but she will last forever." There's more. The Park Service has drawn up plans for a second outhouse in another remote area of the park and indications are that it, too, will cost an eye-popping $1 million. It's all part of a plan to renovate two historic mountain chalets that have provided shelter for hikers for many decades. The upgrade also includes repair work on the chalets and installation of expensive waste water treatment facilities. The whole project is loaded with Park Service overhead. The agency already has spent $860,000 for design and construction supervision teams. In all, the job could end up costing taxpayers more than $6 million. Park Service officials admit they could put the money to better use but say they had little choice: Montana's three-member congressional delegation, reacting to an intense lobbying campaign by hikers, directed them to undertake the project. "We have far greater needs," says David Mihalic, Glacier's superintendent. Mihalic recognizes the "unique experience" the chalets offer but adds: "If somebody handed me $2.5 million and asked, 'where would you best put it?,' the chalets would be far down the list. The problem is, no one did it that way. (Congress) handed us $3.3 million and said, 'put it here.' "
But to Sen. Max Baucus, a Montana Democrat, the project was "a critical investment" that guarantees the chalets will "continue to be a part of the park's future." Despite the congressional support, the project has had a troubled history. A private nonprofit group named Save the Chalets agreed to help the Park Service with the financing. But after nearly three years it hasn't sunk a dime into the project. It hasn't been able to raise much money. To the Park Service, this failure is no small matter. The agency is in the midst of a long-running financial crisis and public-private ventures are seen as a way to foot some of its enormous bills. Here is the picture: The Park Service operates 375 national parks on a budget of only $1.65 billion. That is about a half billion dollars less than the Pentagon spends to build and outfit a B-2 bomber. It also is faced with a staggering $5.6 billion backlog of construction and maintenance problems. Glacier alone needs $200 million to fix its crumbling roads, historic buildings and sewage systems. Some problems can be traced directly to Congress. Lawmakers often trim Park Service construction requests but then turn around and fund their own pet projects, such as the Glacier chalet renovation. Once it gets the money, however, the Park Service knows how to spend it. Most recently, the agency spent $330,000 on an outhouse in a remote area of the Delaware Water Gap National Recreation Area in Pennsylvania. 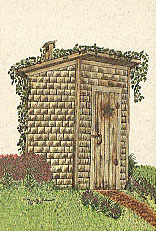 The privy got plenty of attention: In a delicious irony, lawmakers complained that the cost was mind-boggling. Now, they will have the $1 million outhouse at Glacier Park to consider. Established in 1910, the 1-million acre Glacier Park is one of the wonders of North America with its magnificent peaks, glaciers and lakes. In the early 1900s, the Great Northern Railway built two enormous luxury hotels and a series of back country stone chalets to lure visitors west to Glacier. Today, two chalets remain - Granite Park and Sperry, both National Historic Landmarks. Traditionally, the chalets have been popular outposts for hikers. Built at elevations of 6,600 feet, they are several miles from any road and accessible only by foot or horseback. On average during any 10-week summer season, about 4,500 hikers stay overnight, paying a $70 fee to a private concessionaire for a warm bed, hot meals and spectacular alpine scenery. An additional 8,000 or so hikers stop by the chalets. However, the Park Service closed them after the 1992 season primarily because of faulty septic systems, a problem that forced park employees to dump human waste into the park. Both environmentalists and Montana authorities had complained about the situation. The closings angered many hikers and other lovers of the chalets. Led by Wayne Phillips, a Montana state employee, they furiously lobbied Sen. Baucus and his Montana colleague, Sen. Conrad Burns, a Republican member of the appropriations subcommittee that controls Park Service spending. Phillips, who co-founded Save the Chalets, says the wilderness hotels are unique to Glacier. "The cultural history of Glacier is getting people into the back country and providing them some services there," he explains. "That is what the chalets are about. You cannot separate a park like this from its cultural and natural history." The lobbying campaign succeeded. In 1993, Congress appropriated the initial funds for a renovation project. Meanwhile, the Park Service considered several preservation plans. One would have cost only $661,000, but the chalets would not have been reopened to the public. In mid-1994, the agency opted for the much more expensive alternative of returning the chalets to traditional use. This meant building large outhouses at the chalets to handle hiker traffic and improving the sewer and water systems, so that they met federal and state environmental standards. But the project has proven more costly than anticipated. Early Park Service estimates pegged the job at slightly more than $4 million. But the agency already has spent nearly that much and an additional $2 million will be needed to finish the job. Officials insist they have been frugal. "When you build in these remote areas," says Denis Galvin, the agency's deputy director in Washington, "it costs a lot of money." The Park Service says any new building must be constructed to withstand fierce weather conditions. Both the Granite Park and Sperry chalets are covered in snow most of the year and work can be done for only about three months. And because the chalets are historic, the agency says, federal law requires new structures to be built in the same fashion. But not everyone thinks the job should be quite so expensive. Privately, some Park Service officials grumble that overhead costs are way out of line. Park Service files show about $260,000 was spent for agency employees from a Denver support office to design the outhouse at Sperry Park and supervise its construction. An additional $600,000 in similar overhead costs has been spent on other phases of the project. "This project is clearly overpriced for the return," says Bob Heim, a board member of the Montana Wilderness Association, which proposed a cheaper alternative for keeping the chalets open. "The people who visit the park are not staying at these chalets." Heim believes that for $4 to $5 million, the Park Service could have built a much-needed "new visitor center that would have served 100% of the visitors." The Park Service can not count on hiker fees to offset costs. Even when fully operational, the chalets were not self-supporting. It cost the agency far more money to maintain the chalets, which have a total of 64 beds, than it received from a private concession operator. The company, Belton Chalets, grossed $406,000 in revenue in 1992, the last year of full operation. The Park Service's take: $7,748. Most of the construction work has been done at the Sperry site, which includes the chalet, a separate kitchen building and a trails cabin. The work has been tough, including an occasional visit from a grizzly bear. To build the two-story outhouse, construction crews had to excavate 14 feet of solid rock. "The chalet is on the side of a rock cliff," explains Venetz, a vice president of the Montana firm that won the Sperry contract in 1996. According to Venetz, the remote location also required helicopters to airlift 1.5 million pounds of equipment, dirt, concrete and other materials to the site. There were 500 flights made over the past two summers at a cost of about $300,000, he says. Besides building the outhouse, Venetz says, his crews put new roofs on the chalet and kitchen and installed a new waste water system. Next summer, when the weather permits, the crews will finish the job, which includes work in the interior of the outhouse and on its solar heating system. Restoration of the second chalet, Granite Park, was completed last year and it was reopened with limited services. However, the Park Service has yet to award a contract for a new outhouse and waste water treatment facilities there. Before moving ahead, officials say they first want to see some money from Save the Chalets. Indeed, the Park Service sold the entire project as a public-private venture. In an April 1994 finding giving the go-ahead, the Park Service vowed, "The project will not be undertaken without strong private sector financial support." The plan called for Save the Chalets to raise $1.2 million. But the organization did not deliver and the language, requiring private support before the job went forward, was removed from a revised April 1995 finding. Park Service officials maintain they did not mislead the public. Save the Chalets officials say they have only about $30,000 in the bank and hope to raise additional funds from corporations and foundations. Still, they worry the project will never be completed if they continue to falter. Burns, however, seems ready to ride to the rescue. He won't rule out the idea that he might seek more federal money. A fiscal conservative, Burns sees no conflict at all in his support of million-dollar outhouses. "I do not see this as a pork barrel project," he explains. "We are going to get it completed one way or another. We'll just keep pecking away." What else can you see in the images shown? Many times a photo is worth a thousand words and I've only elaborated with a few so here is your chance to add some "color commentary" to my collection. If your addition is worthy, you will find the quote added on the Comments to the Curator page. You can use Email to respond.